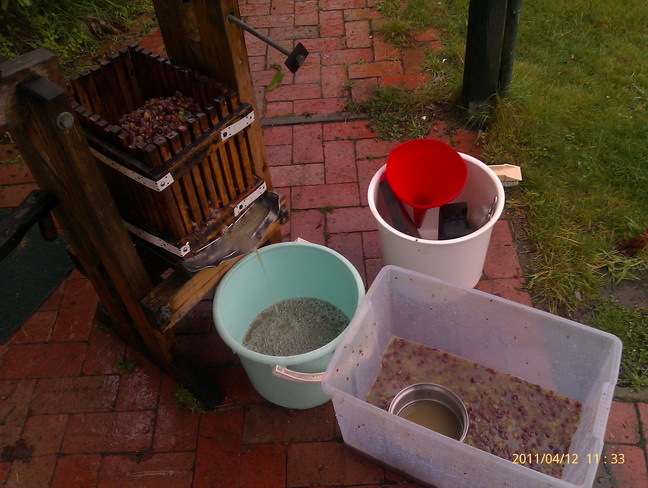 Today was wine pressing time. 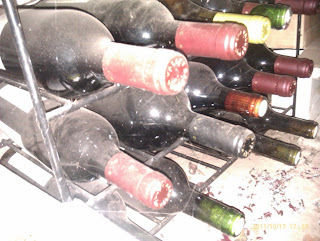 After careful consideration- [tasting the must] it was decided, and all by myself, that there was not enough sweetness to pursue my goal of making some port. Bugger! I had some excess spirit to add as well. People may like dry port, I do not. So the next procedure was to choose to press now and separate the skins, or let it ferment out for a few more days. 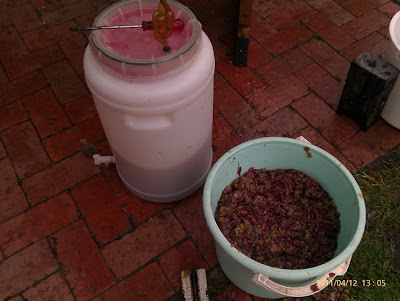 The homemade press was wrestled out of the [crowded] Alcoholery to the lawn and the hose readied to wash down everything after a bit of a scrub and sanitisation of containers and press. Before the rain arrived. Again. More time cleaning and preparing than pressing- what is it with pressed for time anyway- it was over and done with between job shifts! 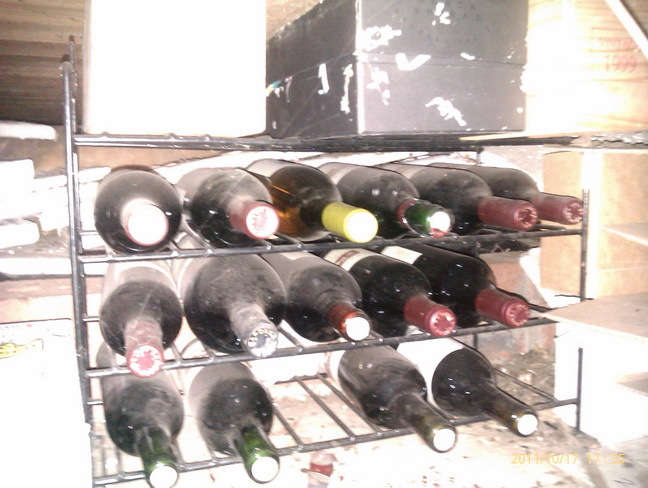 Ended up with about 7 and a bit liters, with any luck about 6 bottles in the end. Again! The taste at the moment is not lush and ‘thick’ like last years vintage, which had to be diluted and blended. 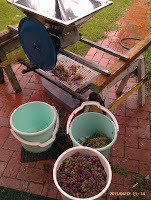 This years vintage is lighter- I think because of the mix of Shiraz and Pinot Noir, at about 6 to 1. It is not that pleasant as yet, after a few more days and some some more treatment with the bentonite, it may be nicer- fingers crossed- or to the Still It Goes. Looking for a reason to learn more about caring for them, I found by accident a site that wanted to sell me a great guide or at least a downloadable pdf file. Well, I have skimmed through and re-skimmed for relevancy to wine grape growing and found it somewhat useful. When I have an acre or two, I will look forward to 45 pounds of fruit off a vine-, that would make nearly 22 kg, or about 16 liters of wine, per plant. Wow, thirty plants now, means-- 500 bottles?!? 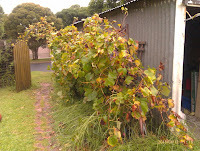 The other day, I went for a walk through the vines looking for faults and all, and saw that the wind during the week had kindly broken a few new canes off two of the vigorously growing Pinot! 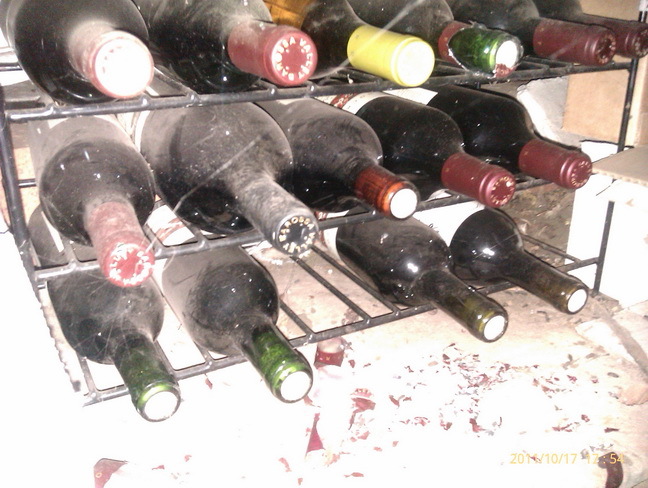 Bugger, as there was a couple of bunches-to-be, lost. In fact, the Pinot is wildly vigorous, so much so that I needed some pointers from the guide. I may cut down the watering to twice a week now, but still give the nursery plants water as soon as the top soil dries out. Soon as the caps fall off, in with some pest and mildew spraying. 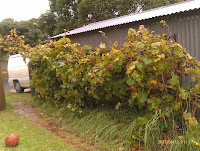 The rest of the plants were looked at and from what I gather, any suckers, and, I gathered, non fruiting canes should be removed, so I did that to the Pinot and Shiraz. Non of the year old plants showed any sign of fruiting this year- so that's good. The two year old plants are not so vigorous, one has some fruiting canes though, and will leave it be. The cuttings are coming along, any that were not leafing up were removed. 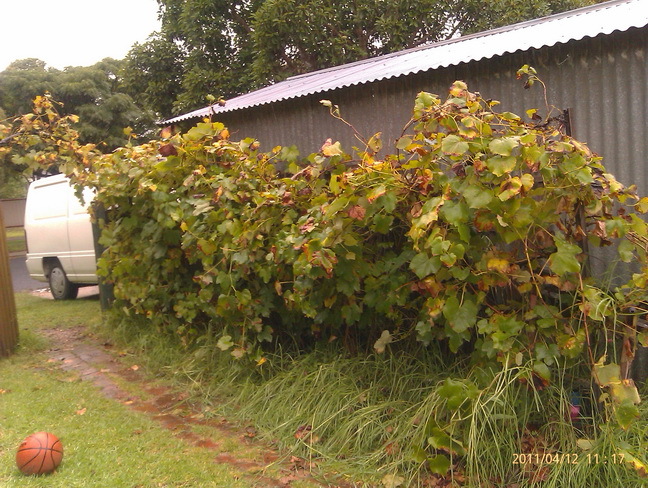 From the SBS television programme "The Wine Lovers Guide To Australia", I think I may have identified the Garage Foxy Grapes as Gerwurtz Traminer, red berries, large, perfumed, and it gives 30 pounds per bush! 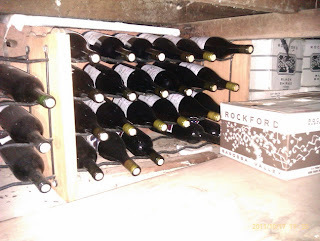 Currently, last years vintage is being fortified, and is not too bad as a sweet, nearly cloyingly sweet, aperitif. IMHO anyway.